At Metaflex Doors Europe we like to contribute to a better environment. Last year, our factory has moved to a new production plant. Due to the new lay-out and the renewal of the electricity and extraction equipment, a considerable amount of energy consumption was already saved. 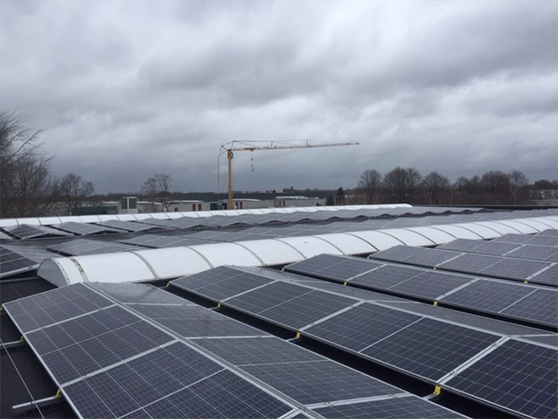 The roof of the new production plant seemed very suitable for solar panels because of its structure and due to the lack of high-rise buildings in the surrounding. A thorough investigation of the entire roof load and an analysis of the safety risks during deployment and maintenance was conducted. Both results were positive and thus in cooperation with Eneco & Solar Partners, as many as 686 solar panels have recently been installed on the roof; this system is expected to deliver more than 170,000 kWh production. Most of the generated electricity we are going to use ourselves, but for example on weekends and holidays, the electricity will flow back to the energy grid. On average, the panels are going to generate about half of the total energy consumption of Metaflex. This not only provides a minor saving on energy costs, but most of all an environmental benefit. A great achievement about which we are very proud of! This does not mean that we are going to sit back and relax. We are continuously searching for opportunities to save energy and make Metaflex more sustainable. For example, our fleet is gradually replaced by less polluting cars; at present 25% of the current leased cars we have are full electric or hybrid and we will go up to more than 50% in 2019. Besides that, we are investigating if there are raw materials in our production process which can be replaced by more sustainable variants. More about this later.